G3 America Martial Arts will be hosting another Fun Day Camp on Feb 15th! 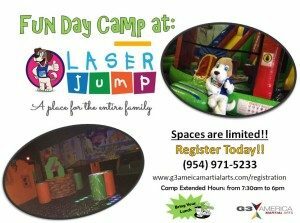 This time around we will be taking a field trip to Laser Jump for laser tag fun and bouncing/jumping time!! Besides our awesome field trip, our day activities schedule are filed with challenges, fun and martial arts.